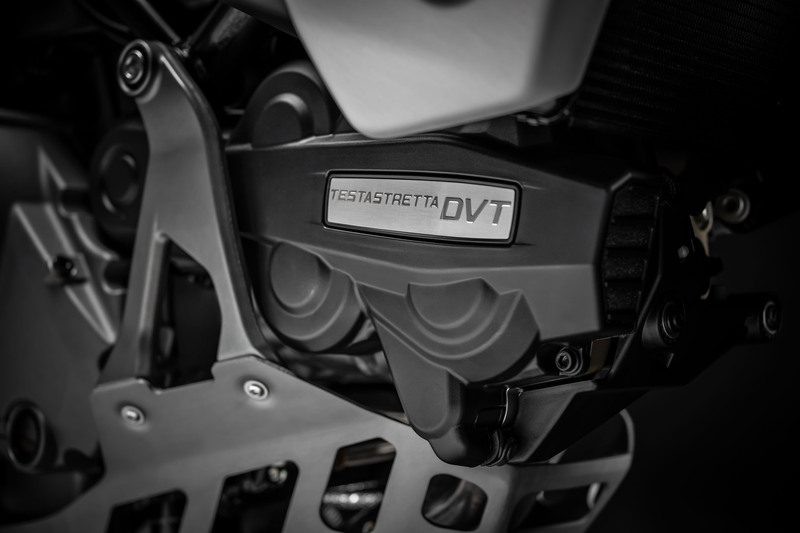 When Ducati presented the Multistrada 1260 at EICMA last year, we figured it would just be a matter of time before the more off-road oriented Multistrada Enduro model got the same 1262cc Testastretta engine with Desmodromic Variable Timing. That time is now here, with the announcement of the new 2019 Ducati Mutlistrada 1260 Enduro. As with the regular Multistrada, Ducati replaced the previous 1198cc powerplant with larger 1262cc engine. Ducati claims the extra 64cc translates to a 6hp increase to 158 hp at 9500 rpm while peak torque remains at 94 lb-ft. at 7500 rpm. More vitally, the engine delivers 85% of its maximum torque before reaching 3500 rpm. 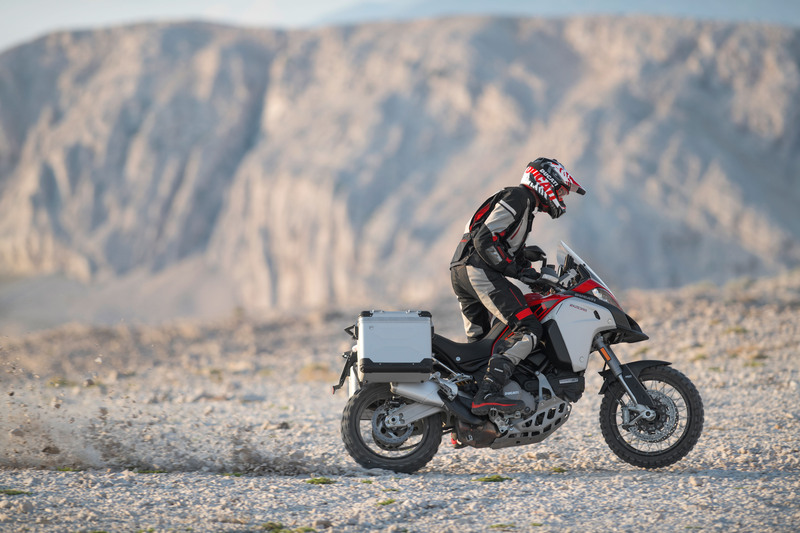 The transmission offers six gears, with a shorter first gear than the regular Multistrada 1260 for improved off-road performance. Ducati updated the Ride-by-Wire system for smoother throttle control. Ducati also added an up and down quickshift to a technical package that already included a six-axis Bosch IMU, cornering ABS, cornering lights, traction control, wheelie control and hill start control. The semi-active Sachs suspension system also returns with recalibrated settings, though suspension travel has been reduced to 7.3 inches from 7.9 inches. Ducati also revised the ergonomics, lowering the handlebars and reducing the seat height by 0.4 inches to 33.9 inches for the standard saddle (higher and lower accessory seats are available.) The result is a lower center of gravity compared to the Multistrada 1200 Enduro. The Enduro retains its trellis frame with large-diameter, low-thickness tubing. The rake remains unchanged at 25° but the offset was increased a hair to 111 mm (4.3 inches). Up front, the Enduro runs a 19-inch wire spoke wheel with a 17-inch wire spoke wheel at the back. 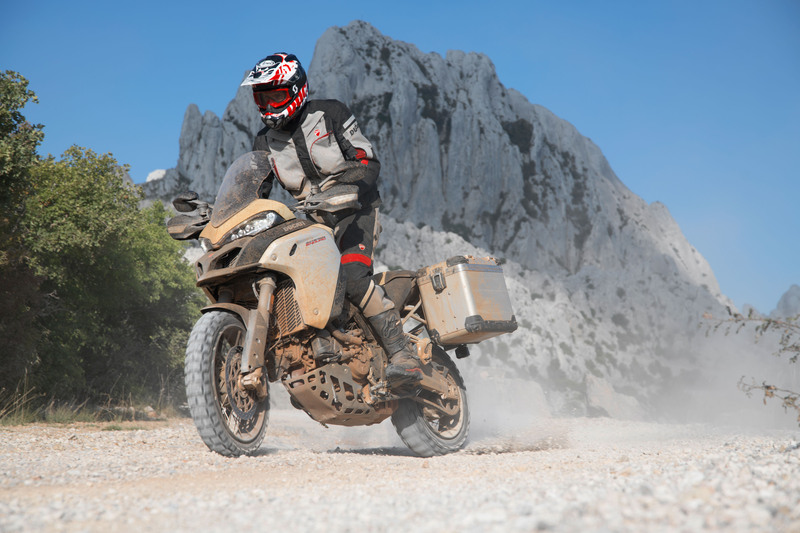 Pirelli Scorpion Trail II tires offer a balance off on- and off-road performance, but Ducati also offers Pirelli Scopion Rally tires for better off-road capability. Brembo supplies the dual monoblock four-piston brake caliper and 320mm discs for the front brake as well as the 265mm disc with floating caliper on the rear wheel. 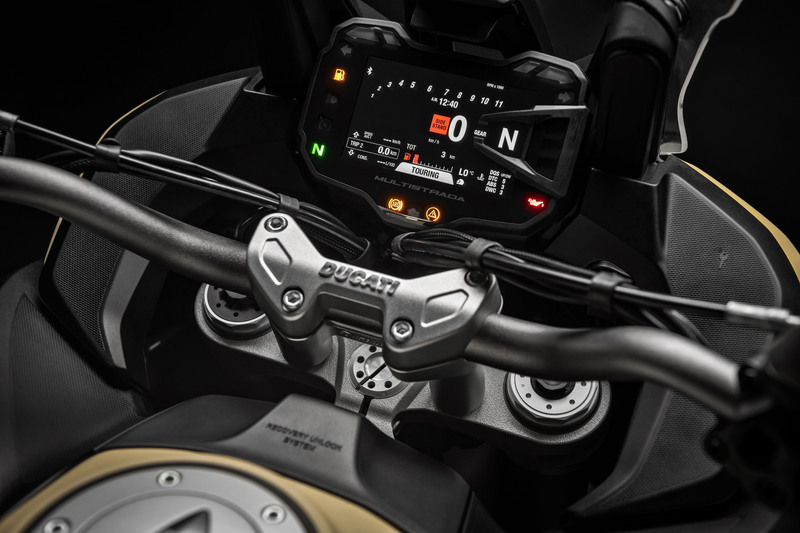 Other features include a 5-inch TFT display with a revised interface, Bluetooth connectivity, cruise control, 7.9-gallon fuel tank and compatibility with the Ducati Link app for personalizing riding mode settings via a smartphone. The 2019 Ducati Multistrada 1260 Enduro will be offered in two color options: Ducati Red and Sand. Ducati will also offer four add-on packages: Touring, Sport, Urban and Enduro each with a selection of accessories such as luggage, crash bars and supplementary lighting.